Accurate diagnosis of the type of neurofibromatosis is ­important for patient management and genetic counseling. In the majority of people with neurofibromatosis type one (NF1) and type two (NF2), the diagnosis is straightforward. In a ­specialist neurofibromatosis clinic, approximately 2% of new NF1 referrals will have an alternate non-NF diagnosis and 5% will have a specific NF subtype. 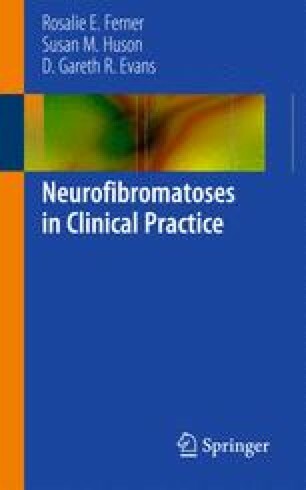 This chapter reviews the differential diagnosis of and conditions related to NF1 and NF2. I am grateful to Dr. Rick Whitehouse for providing Fig. 3.5, Dr. Emma Burkitt Wright for Fig. 3.6, and to the patients who have allowed me to use their pictures and clinical histories. Messiaen L, Callens T, Williams JB, et al. Genotype-phenotype correlations in spinal NF [abstract 985]. Presented at: Annual Meeting of The American Society of Human Genetics; October 25, 2007; San Diego, California. Available from: http://www.ashg.org/genetics/ashg07s/index.shtml. Online Mendelian Inheritance in Man, OMIM (TM). McKusick-Nathans Institute of Genetic Medicine, Johns Hopkins University (Baltimore, MD) and National Center for Biotechnology Information, National Library of Medicine (Bethesda, MD), 2011. http://www.ncbi.nlm.nih.gov/omim/.
. Christiaans I, Kenter SB, Brink HC, et al. Germline SMARCB1 mutation and somatic NF2 mutations in familial multiple meningiomas. J Med Genet. doi: 10.1136/jmg.2010.082420.